Keep the trick-or-treaters from your door by hanging this scary IT-inspired sign out in the garden. The menacing carnival clown holds a knife and a sign with the instruction ‘keep out’ scrawled in blood. If that’s not creepy enough, watch out for the spiders and rat crawling over the top! 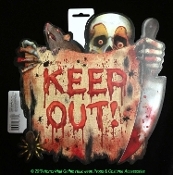 Lightweight Double Sided Plastic Gothic Horror Warning Sign is Suitable for both Indoor and Outdoor applications. NEW Detailed REALISTIC SCARY, SPOOKY and GROSS... Fresh Decor from a Creepy Haunted House! NEW spooky sign for haunted house, yard, dungeon, graveyard tombstone cemetery scene or costume party wall decor. Lightweight flat plastic form with design on both sides, so suitable for display on windows and glass doors. Bone chilling saying with design, as pictured. Hole at top to hang on wall, door or cemetery fence. Warning: Keep away from heat or flame.